Lernort Studio is an educational institution subsidized by the city of Dusseldorf and the state of Northrhine-Westfalia in Germany offering classes to high school students. Sculptor Michael Kukulies supervised the construction of this proa by his woodworking students at studio. It is based on the original blueprint of the proa MELANESIA designed by James Wharram. 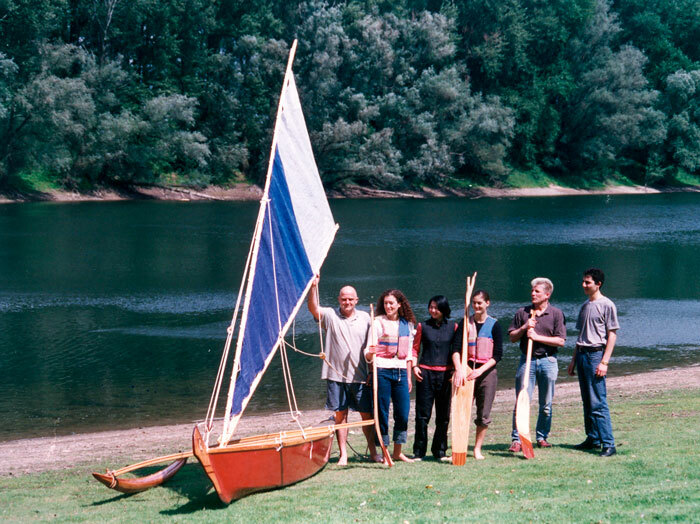 The length of the proa is 19'8", beam is 6'7", and it carries a Polynesian rigged sail of 45 square feet. Both traditional and modern woodworking methods were used in its construction. Visit us at our home page www.Lernort-Studio.de.